It’s that time of year when thousands of migratory birds stop over in the city on their southward journey. This year, however, the number of winged visitors is much less this time and ornithologists attribute to indiscriminate habitat changes and the drought. In the last years, there has been a significant decline in the number of birds visiting fresh inland water bodies (tanks, bunds and reservoirs). A variety, species of birds were found at places like Vaccine Depot and Queens Garden in Camp. However this year, one can hardly find birds other than crows in the city. Sparrows too are hardly seen in the city. Noted bird photographer Gangadhar Ghasari said that lack of rains has affected on the migration of birds, keeping them away from this region. Birds migrate in those areas where they find abundant water and fascinating nature. However most of the ponds, streams, lakes and other water tanks have dried, forcing the birds to find some other place for nesting. In the village Badas about 30 kms from the city, one can see the presence of the birds but the number is very minimal. 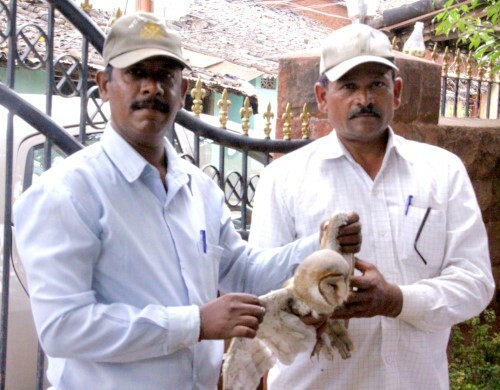 Jaideep Siddannavar said that usually the larger sized birds hatch during the month of September and the smaller size breed hatch during August. He said that Little Cormorant nests between June to October and lays in an average 3 to 5 eggs at one time. He said that Little Egret or the Common Crane birds nesting period is from June to September. Darter breed’s hatching period is October and it hatched about 3 to 4 eggs at one time. Siddannavar said that the arrival of the birds and their returning period also depends on the species. Some species are comfortable here during rainy season and some in winter. However most of the migrated birds return to their respective home land during February month. Birds photographer Veeranna Madiwalar said that earlier he use to find birds of different species at the island of Kote Kere (fort lake). He said that it had about 40 species of birds which included like Indian Spot Billed Duck, Pond Heron, Little Egret, White Throated King Fisher, Red Wattled Lapwing, Black Winged Stilt, Grey Heron, Eagle and many other species. However, now it is difficult to find birds there, he said. Amrut Birje who also like to click photos of birds said, this time it was really hard to spot the flock of birds. Early morning now one has to go in search of a water body where you will find 5-10 birds which is very sad. It is possible to form a Belgaum collective and add bird sigthings and other detial. There is ” December challenge ” going on. It says for a given city/region that is divided into small grids ( ebird ) does it for you. It is expected for each of the grid someone spend about 30 minutes only and note down the different species obsereved in those 30 minutes and their counts. if possible one can put the data as male/female also. It is a funny situation.. reply to your posting.. I see there already as many as 75 speciecs count listed on the ebird.org for vaccine depot.. That means people are already working hard and documenting.. Hope this spreads to more people..
Do we have a bird rescue number ? A couple of times I have seen injured birds but no information on how to help them out.